We recommend dresses be steamed upon arrival. Hand wash in cold water and line dry. Due to different fabric batches used in the making of the dresses the color may vary a little bit from the picture. Tulle, Rose puff flowers, Metal pearl rhinestones, Satin ribbon, Pearl trim strand, Stretchy crochet bodice. 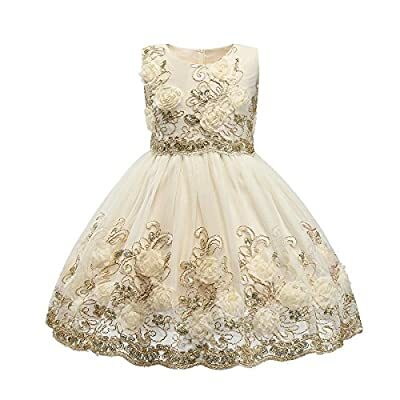 This darling dress is perfect for any little girl and occasion, flower girls, baptisms, Birthdays, weddings, photos, birthday parties, church, baptisms, Photography Prop and more! FASHION DESIGN: Sleeveless Knee length zipper back Handmade sewing fully lined. Unique designed soft cotton Lace blending and polyester Lining and bow, with layers of gauze petticoat. QUALITY: Premium high quality lace, soft fabric and high quality selected satin embroidered dress. It's 100% brand new with tag and high quality. OCCASION: This tutu dress is perfect for any little girls and occasions, flower girls, birthdays, weddings, photos, birthday parties, church, baptisms, Photography Prop, family gathering, graduation, formal event and more! FEATURE: Girls flower dress, floral dress, Princess dress, Bow-tied, Zipper closure, Knee Length dress-Neck. More Suits for 2-8 years old teens girls in all seasons: Spring, summer, autumn and winter. CLEAN: Gentle wash with mild detergent and hang dry are recommended. Dry clean is also a good option. Do not bleach, and use hot water.